The Canada Violet is a member of the Violet Family. It grows to 1 foot in height and has green heart shaped leaves with toothed margins which grow to 3 inches in length. The plant typically grows in moist coniferous forests at elevations between 6000-11500 feet. The Canada Violet at right was photographed in Secret Canyon near Sedona. 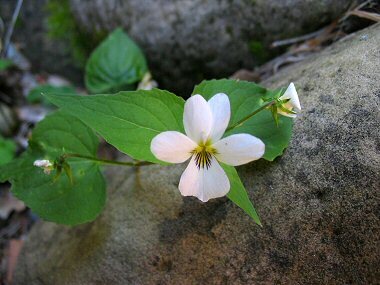 Canada Violet typically blooms between April - September and produces white flowers with a triangular lower lip petal to 3/4 inches in width.